k of polymers is very low (~ 0.2 W/mK). This can be increased by 2 orders adding h-BN platelets without affecting electric conductivity. For thermal properties carbon and BN are comparable, due to a phonon-dominated thermal conduction. k of nanotubes is close to that of in-plane graphite which is excellent (3000 W/mk). The k of polymer/nanotube composite is now being studied by several groups but results are still unpublished. At this point, it is probable that NT filling will drastically increase thermal conductivity. However, it is not clear if the benefit will be higher than that of standard powder fillers. We may hope that same level of increase can be obtained at much lower concentration of the filler, and hence with far less deterioration to the original properties of the polymer. 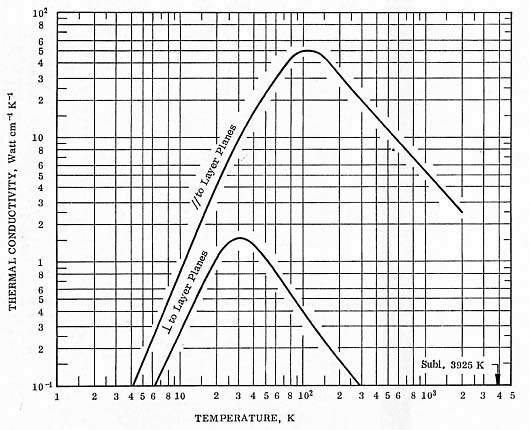 raphite is remarkable for its very anisotropic k. It is an excellent thermal conductor through parallel planes (2000 W/mK at room T), but a thermal insular through perpendicular planes (0.1 W/mK at room T). Measurements are almost absent for pyrolytic h-BN because pyrolytic h-BN is little available. The measurement of an imperfect pyrolytic h-BN sample indicates 60 W/mK for parallel planes, and 2 W/mK for perpendicular planes. The relatively small difference between parallel and perpendicular conductivity is probably due to bad alignment in the sample. Advanced Ceramic Corporation, Measurements on pyrolitic BN, 22557 West Lunn Road, Cleveland, Ohio USA 44149 (web site only). A similar k for graphite and h-BN is possible. Indeed, thermal conductivity of graphite and h-BN is dominated by phonon conductivity, which is expected similar for both materials. k of carbon nanotubes has been studied by many authors. All agree that it is similar to the parallel k of graphite. Shi measured k = 3000 W/mK at 300K for a MWNT, and k = 1200 W/mK at 300K for a 150 nm MWNT bundle. Hone et al. estimated k =1750 to 5800 W/mK for a SWNT rope at room T. They also reported a linear increase of k with T at low T, and evaluated the phonon mean free path at 0.5 to 1.5 micron. Che calculated for a (10,10) SWNT k = 2980 W/mK. Srivastava et al. calculated for a (10,10) SWNT k = 1500 W/mK at 300K, and a peak k = 2700 W/mK near 400K. Berber calculated a very high value of k = 6600 W/mK for a SWNT. Maruyama calculated k for a tube shorter than phonon mean free path, and found an increase from 200 to 600 W/mK with length. Several ceramic platelets-polymer composite have been studied. h-BN was reported to give best results (13 W/mK). The modelisation of polymer/nanoparticule composite was undertaken. Some thermally conductive polymers are already commercially available, some of which are also electrically resistant. k measurements of polymer/carbon nanotube composites is now being studied by several groups, but results are still unpublished. The Science Daily reported that the Rensselaer Polytechnic Institute obtained disappointing results and argued that it was due to the nanotube/matrix interface. One team at The University of Tennessee USA, has measured k for an aligned NT mat immerged in aminoepoxy resin, but results are under publication. A report of polypropylene/vapour grown carbon fibres indicates up to k = 5.4 W/mK for 23% filler addition.